B and B…Ballooning & BRISTOL! MAJESTIC hot air balloon! It was cool, almost cold. Spring in England is oftentimes cold. Latitude and longitude coordinates: 51.454514, -2.587910. I was at Long Aston in the City of Bristol in the West Country… I was waiting to RV (Rendez-vous) with the people from a hot air balloon company. Bristol is the hot air ballooning capital of the United Kingdom. It is a fact that I only knew when I visited this fair city by the sea, which is also a port. There were some other ladies and gentlemen. From observing them I could tell they were somewhat snooty or what Germans call ,,hochnaesig” (high nose or stuck up)…except for two ladies…They were nice and we soon became friends. Sometimes you just know who can be your friends. I like people with good “auras”. Gwynneth or Gwyn for short is the mother of Sian Powell and both are true-blue Bristolians (is there such a word?). After a long wait to gather the troops as it were, we all clambered into Land Rovers to drive from Bristol to Bath. Yes, Bath. The only city in the world that when you leave…you are clean…Wahahahah! Think about it mes amis! It was a long drive…I fell asleep. One learns to sleep anywhere…so that when you need the energy, you have it. Royal Victoria Park, a short stroll from the city centre, is a ravishing expanse of green parkland. Originally an arboretum, 57 acres of greenery delights the nature lover. Dating back to 1829, the park is named after Queen Victoria, who officially opened it in 1830 at the age of 11! I strolled around the park while the Ballooning crew unpacked their balloons and other gear of which there was a lot! It reminded me of my parachuting days as the balloon is also made of high quality nylon and had to be unfolded. Like packing a parachute in reverse order. There were several other balloons being readied for the flight. I realized that Royal Victoria Park was the usual take off point for hot air balloons. All very colourful they were, looking almost like multicooured parrots. Next a large power fan like those used in Hollywood to create the effects of a storm or gale was used to partly inflate the balloon. Next came the loud and rather fightening orange gas flame from LPG burners. The flames were very close to the nylon material of the balloon and I thought in my mind: If the nylon catches fire, everything will go up in flames! After about 30 to 40 minutes, the hot air filled the BIG balloon and it started to come alive! It was anchored to the ground and the Pilot clled us to board the basket. It was a huge ratten basket divided in to 5 sections. The Pilot in the middle and four separate compartments contained 4 passengers in each section. Altogether 17 of us! Although there were 17 passengers the lift from the hot air was quite powerful and we rose up quite fast more or less straight up. The Pilot spat a lot to check the wind direction. Rather disgusting but he assured us that it was SOP (standard operating procedure). I thought in my mind : >Surely in the 21st Century there must be a better way of checking the wind speed and direction!! !< It was really, really nice. Cooool! Calm, quiet, peaceful…like floating on a magic carpet in Scheherezade’s 1001 Arabian Nights. It was only VERY NOISY when the Pilot turned the handle of the burner to increase the flame so as to get more lift! Well, the good news is I am still here to tell the tale. All too soon, we were nearing Bristol and as we passed over a lake it was only about 600 feet ASL. It was all so amazingly beautiful! Sublime and magical…You must really go up in a hot air balloon to really appreciate the awesome beauty of it all. The scenery, the feelings of freedom and joy…the exhilaration…Mere words do not give it justice….We dropped to 500 feet ASL and I could see some boats and pleasure craft on the Chew Valley Lake. Actually, one can still parachute and survive from 500 feet or less. In airborne operations in combat on a HOT LZ, paratroopers static line parachute from 200 feet ASL which is bone-breakingly hard. I expected something like a parachute landing which can be very hard. People break their legs and ankles routinely when they land by parachute, so I held on very tightly to the rattan of the basket and braced for landing. A bump and some scraping along and we were down in one piece. “Suprisingly gentle!”, I thought happily. We were all very overjoyed and exuberant after a most happy balloon flight and had taken lots of photos, mostly with our smart cellular phones…but now BAD news. Murphy’s Law and stoopid people! BRISTOL, the city of Bridges, Balloons and Boats! The farm, our LZ (landing zone) was not far from Bristol and Sian asked the driver, who was probably the retarded twerp who had immobilized the other Land Rover, to drop us near the Angel Inn, which is the oldest Public House in Bristol. I learned to my joy that it was owned by none other than modest and kind Sian Powell, the daughter of charming Gwynneth! Fortune favours the good! We walked from where we were dropped off about 300 meters to arrive at…the salubrious and ancient Angel Inn. Oh Happiness! Warm, cosy, cheery with food and drink! Wahahah! Goodie goodie Yum Yum! Gwynneth and Sian’s hospitality was very much appreciated! Thank you so much Gwynneth and Sian from The Travelling Gourmet TM! 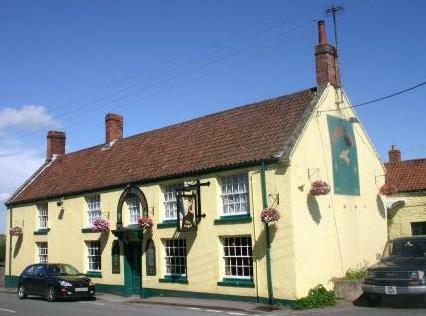 The Angel Inn is a really, really nice pub with good food, where you can also stay in-house. The earliest records for this building date back to 1495 when it became the Church House. It was used as a sort of parish hall for meetings and social events, the most important being the ‘Church Ale’. This was held several times a year, whereby church wardens sold food and ale to raise funds for the church, together with merry making, dancing, plays and other fun-filled festivities! This entry was posted in Art, Entertainment, Food and drink, Friends & Comrades, History, Hobbies, Let them eat Cake..., News and politics, Nobody's perfect..., Travel, Voyages, Wine Appreciation and tagged Airborne at 2000 feet ASL, Angel Inn Bristol, Bristol Ballooning' Bath, Dr. Michael Lim is The Travelling Gourmet TM. Bookmark the permalink.